Home > Competitions and Giveaways > WIN a Gold Coast Escape for 2 Worth Up to $3,500!! WIN a Gold Coast Escape for 2 Worth Up to $3,500!! Return flights from winner’s nearest capital city to the Gold Coast. One of the following experiences. Hit the pink button right now. Complete the short survey and enter your details for a chance to be the lucky winner. We wish a good luck to all the entrants. The competition closes July 9, 2017. Make sure you share it with your friends on facebook. 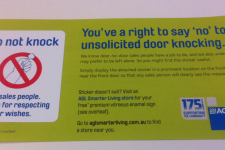 FREE Do Not Knock Stickers! I'm a mother of 2 kids and I LOVE trying products for FREE and saving a lot on daily grocery! I spend my time hunting for the best freebie and saving offers available in Australia!